Which digital system for limited space??? I am completely limited to a 4X8 table that is already built and barely fits in the spot I have for this. So please don't recommend a bigger table, can't happen. My number one priority is a pit lane with re-fueling which rules out SSD even though their track would give me the best setup. But their ability to run lots of ghost cars is very appealing. I love SCX's set up but I haven't seen too many pics or layouts that would fit in a 4X8. Can you get a decent layout in this space with their track? Any chance that SCX is working on a better ghost car system? I do alot of track time alone so that lack is really keeping me from pulling the trigger on SCX as everything else I read seems great, especially the customer service. The lack of being able to use other cars really is not a factor for me. Carrera's track is just too big to get a decent 4X8 layout from what I have seen but they have all the bells and whistles that I want so I keep considering them. Anyone been satisfied with a small Carrera layout? Finally the red herring, Ninco Digital. They seem to get the least attention but their master track is made for a 4X8. They have a pit feature, though not as nice as SCX or Carrera, but ghost cars appear to have to be done with an aftermarket piece I see on ebay. Anyone have one and does it work? Anyone think that squeezing another brand onto a 4 X 8 table would be better in the long run over Ninco's master track? Hopefully you see my conundrum, none of these seem just right. If only you could have an SCX style pit feature on Ninco, I'd be set, but it doesnt exist. If anyone has layouts for Carrera that would fit (that havent already been posted) or especially an SCX layout on a 4 X 8 it would be much appreciated! First off, I assume you don't or can't have a computer hooked to the track when you are using it? Not even a laptop? It doesn't take a lot of power to run race management software, which would give you the fuel strategy stuff with SSD, if that's what you want. If that's your only hold up with SSD, give it some thought. You should be able to fit pretty much the same layout in SCXD as SSD in a 4/8 space, especially if you're sticking with magnets where borders are less needed. SCX ghost cars will always be the dedicated car/chip. You can move the chip to other cars, but you'll be limited by how many of those you purchase. 4x8 is too small for a full size Carrera track, but have you looked into D143? Their stuff is pretty good, though limited to 3 cars. Some people love the scale so much that they buy 132 stuff and replace the 143 electronics (black box, etc) with 132 electronics, giving them the full feature set on the 143 size track and cars. Not the cheapest way to go, but great for limited space. 143 cars are pretty good, but to get the performance and detail of 1/32, you're often paying a lot more than 1/32. Ninco, well... I won't get into that. It's nice that their set is designed for a 4x8, but 4x8 layouts of all kinds are not hard to find or design. So... SCX will probably work ok (though I'd rate it below SSD and Carrera overall). SSD you'll want a computer for best features, and Carrera you'll want their 143 track and cars. Thanks Mr. F. Believe it or not I have a dedicated old computer under my table! I did not use it for my HO set up because I had purchased a slot dragon timer and did not need the computer. I had totally forgotten about SSD's computer aided enhancements. Know anywhere I can read up on them? Do you use their standard pit lane track to make all that function? I looked at the digital platinum set but man that is pricey!! I see many used smaller SSD sets on ebay for way less and I guess I could add track and accessories. Thanks again! Here's an SCX example. 4x8 is a little tight and the borders will hang over slightly on the ends. You can probably get a pretty good deal on SCX if you look around. Not a bad system at all. You should know that SCX has recently been acquired by a much larger company so we are waiting to see what the new ownership decides to do. We've had our system running for the past 5 or 6 years. ^ my kind of track with my limited space for now. Very similar to my ninco layout. I would really go SSD if you still shopping. (sorry I did not read the whole thread) but SXD is great too. You don't need the SSD Platinum set, but you will want the Advanced 6 car Power Base (C7042 aka the "APB"). That, plus a cable to connect it to the computer, and you're on your way. There are a few RMS applications you can try out and choose between, including SSD Console, PC Lap Counter, and Race Coordinator Digital, as well as a couple others that are still in the works. Having the pit lane track set will give you somewhere to pull out when refueling, so it's a good idea to have that. The APB is like having the entire line of SCX or Carrera accessories all in one unit. Some people like all the extra "things" around the track, though, like you get with SCX or Carrera. Carrera can be hooked up to a computer, too, though, so many of their accessories are not needed, especially if you get the new CU rather than the old BB. I think SCX needs a special track piece to connect to a computer, but kidvolt can answer that. Without a computer, though, SCX really needs the lap counting and timing accessories, which will take up space on such a small track. I was too enamored with the fueling idea from SCX-D. They were the brand the turned my into slot cars period. I began my research and out of the box they are the best when it comes to that. However I think that if you implement an laptop with SSD for example you will have more room to grow in the hobby. At this time you are probably looking at SCX cars ect, but overtime you will want to try slot.it, avantslot, NSR and even racers. At least that is how it happened with me. SSD allows you to run almost every car. Not only that, if you happen to like digital, SSD is a great path to Oxigen. Believe me once you go to Oxigen, you don't want to go back to regular SSD. (I know Greg is going to kick me in the face for saying that lol ). But all jokes aside, really consider SSD. If you want a small test track, you can get the powerbase by itself and 2LC and some used or opened track. Scalextric track is pretty affordable and all over the place. So you do not need to get the "ultimate" set. Also invest 20 dollars in track power. The software has paid its self over and over for me. Let us know if you have any questions. I would just buy the Platinum set. He will have the APB, 6 digital cars and controllers, and plenty of track for an 8x4 space. I have seen it for less than $650. It seems like a fair price to me. Of course, it's easy for me to say since it isn't my money! The pit lane track costs about $50, right? How much does the software and cable go for? Nah, I think oXigen is cool, too. I'm still planning to get some to play with, probably when the smaller chip comes out. You can get more track in the 4x8 than kidvolt shows, even with SCXD and a pit box. The pit lane takes up most of the 8' length, but it can be done. SSD would need the same amount of space for a pit lane, too. Google image search for 4x8 ssd layouts and you'll probably get some good ideas. The Platinum set IS a good deal, especially at lower/sale prices. A pit lane set is about $50-60. The cable is about $40 (contact Rich G aka "slotfiend" or Colin C aka "rikorocket" for their prices, they each sell their own cables for SSD). You'll also need at least one pack of single lane half straights, or two packs if you're unwilling to slice a standard straight in half to make up for the others. That's to go along side the pit lane pieces. All the software has trial times/limitations so you can try them all out before deciding which to pay for. There are no free SSD RMS though, that I know of. Last edited by MrFlippant; 08-29-2012, 10:59 AM. Wow, great replies! I see a definite trend of leading toward the SSD. I know I can get a basic system pretty cheap and then upgrade to the 6 car base and a pit lane. I will look into the programs for the computer to price those too. I see the dollar signs adding up as I write this and that doesnt include needing to buy more track and cars! I see no one really commenting on Ninco? Anyone care to share why they seem to be the black sheep? for me its way their throttle resolution (steps), is not as smooth as SSD which has the highest before you get into the "pro" stuff. Also their put lane game was just lame, you cannot connect it to a PC and get the same you can out of SSD. Also brakes are always on and very hard. As you start to drive more and more, and without magnets (if you get into that) you want smooth throttle response. 1) The latest N-Digital sets come with a newer central console that has improved throttle response. 2) The central console has a track call button which cuts the power to the track giving the opportunity to reset the cars back on the track. 3) The lap counting is very accurate which is one of the most important functions for any slot car track. 4) The NINCO track is about 1/2 an inch wider than SCX and Scalextric track which allows an extra room for passing. But takes up less space than Carrera. 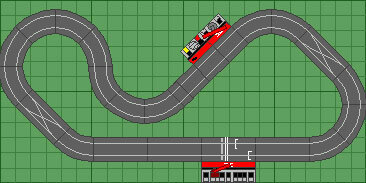 5) Ninco track has excellent electrical track connections which is especially important with a digital slot car track. 6) Ninco track has a textured surface which offers excellent grip with most stock rubber tires. This allows for really good racing with the cars that have the traction magnet removed. Ninco track also makes the need for buying aftermarket tires unnecessary which saves money. 7) The aftermarket ghost car box works really well. The only downside is that the cars will enter the pit lane so it isn't compatible with racing in the pit stop mode. I prefer racing 1/32 slot cars without the traction magnet so N-Digital is a very good choice for my needs. The Ninco brand of slot cars run especially well with out the traction magnet on a Ninco track. Other brands of slot cars can also run well on a Ninco track but some tuning may be involved. For starting out, your best experience would be to use the same brand of cars as the digital system that you purchase. Each digital system currently on the market has it's positives and negatives. You can have a good experience with any of the brands so it comes down to picking the system that best suits your needs. Thank you for that feedback. I really wanted to hear from a Ninco user before making a decision. However, I am looking at a used Ninco unit so the throttle response "may" be an issue with that set. But I am coming from AFX HO cars with stock controllers. I am not sure you can get more "slushy" than that!! Good to know that the ghost boxes work. Based on the feedback it may just come down to what is available used when it comes time to buy. I really like both the SSD and Ninco sets and once all the upgrades I want are purchased the cost will be about the same. SCX is probably going to have to bow out since the ghost car thing is just not there and that is pretty important once the pit requirement is satisfied. So it is down to those two. Any other feedback is appreciated! Love the forum and thanks to all who responded! How many cars will a ghost car module on Ninco control? Can you program multiple cars to the same ID so that one pace car module can control multiple cars? Or, would you need to purchase multiple ghost car modules to do multiple cars? From what I read on ebay from the person selling the ghost car modules, one per car. Looks like they just plug into a controller slot and you set the speed you want and whether you want the car to change lanes. They are selling for $40 for ones that cant change lanes and $75 for ones that can. That can quickly add up to more than it would cost to buy a 6 car APB from Scalextric! Decisions decisions!! !